What's New in Dump Trailers? Think you’re seeing a lot of aluminum end-dump trailers in recent years? You are. 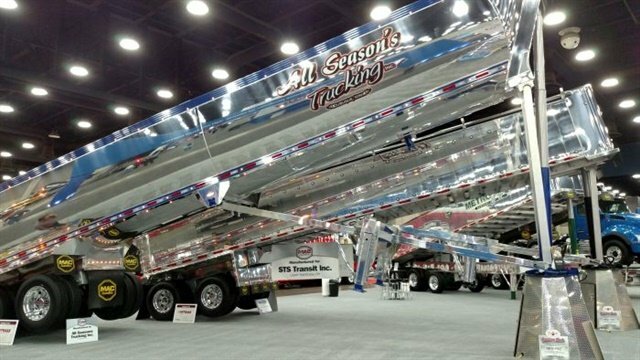 Aluminum’s light weight and resistance to corrosion means they now account for eight out of 10 new dump trailers in the United States, builders say. In addition, there has been a trend toward smooth-sided double-wall dumps and away from the outside-braced, sheet-and-post type. Meanwhile, hardened steel has become the chosen material for steel dump trailers and bodies, which are preferred for loading and hauling of rough materials. Smooth-sided aluminum dumps are now widely available, notes Charlie Wells, vice president, sales and marketing, at East Manufacturing in Randolph, Ohio. “We were the first, with our Genesis in 2001,” he claims, “and now everybody’s pretty much copied it.” Genesis uses square-tube aluminum extrusions that are welded in a line to form the double-sided walls. The main advantages are inherent strength and confining of dings, dents and bulges to the inside surfaces. Lessons learned from early models required engineers to revise the types of alloys employed and certain structural details – an “expensive learning curve,” he says. The type of aluminum alloy used in Genesis sides is proprietary. Square-tube aluminum extrusions that are welded in a line form the double-sided walls on East’s Genesis dumps. Photo: East Mfg. Sand, gravel, crushed stone, and asphalt, the materials commonly carried by aluminum construction dumps, are comparatively easy on walls, floors and other parts. But trash-transfer dumps encounter pieces of wood and metal, even whole washing machines and other appliances that can batter interior components. Sheet-and-post trailers show such wear, but Genesis sides do not, Wells says. They also are very rigid, so resist twisting. Mac Trailer, East’s principal rival down the road in Alliance, Ohio, offers the smooth-sided Mac Vertical Panel, or MVP, says Joe Dennis, director of dump products. Its sidewalls are also square-tube aluminum extrusions, though joining of the tubes differs somewhat. “It’s very popular, because the wear is on the inside and you do not show dents on the outside of the trailer,” he says. “A sheet-and-post trailer will show that dent to the outside.” About 75% of the aluminum trailers Mac builds are MVP. 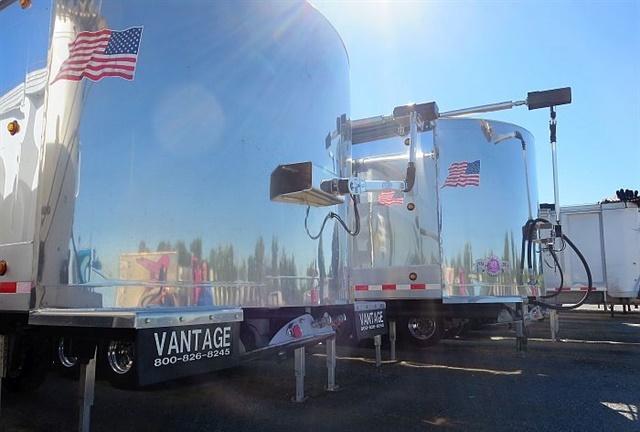 Vantage’s end-dump trailers have single side sheets with top rails and center ribs. Thickness of the metal varies from 0.130 to 0.25 inch, based on stresses encountered by different areas of the body during service. The material is a type 5454 aluminum-magnesium alloy with an H32 surface hardening. East and Mac also use type 5454 and other 5000-series alloys for wear surfaces; Wells says East employs 6061 for top-rail and crossmember extrusions. Although East and Mac are best known for their aluminum trailers and truck bodies, they also build steel trailers. Wells says East got into them in the 1980s due to dealer and customer demand for vehicles that must carry sharp-shaped and abrasive materials. 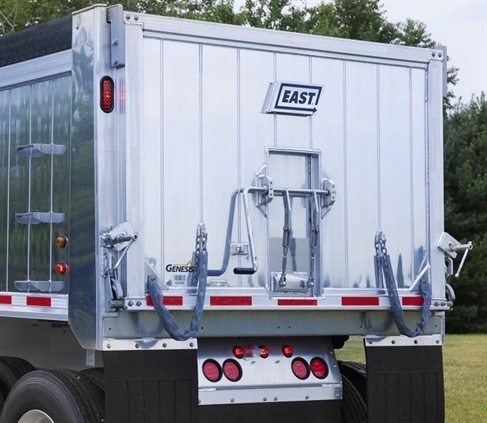 “Basic design specs were sort of duplicates of aluminum trailers,” which East began making in the late ’60s. “But after five, six years of use, you find crevices that are OK with aluminum, places where corrosion can occur because water gathers. Most builders have tried to eliminate places where water can congregate” and steel begins rusting.